The GF6 is without a doubt better than its GF5 predecessor. However the addition of Wi-Fi hasn't really pushed the series forward - instead it's down to the improved 16-megapixel sensor, ongoing ace autofocus, new mode dial and fairer sub-£500 price that makes this camera well worth a look. Battery life, the reflective LCD screen and Wi-Fi's limitations are the areas we'd like to see improvements in, but otherwise the GF6 has got both image quality and movie mode wrapped up nicely. 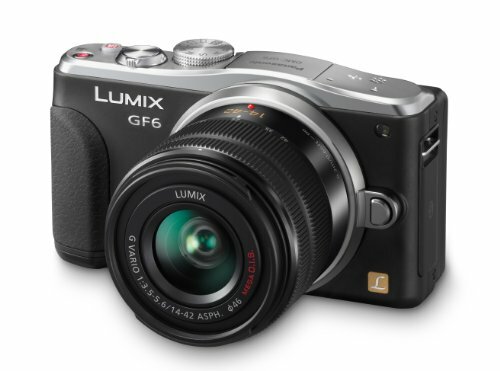 The Panasonic Lumix GF6 is far from just a subtle upgrade to the series. Even though there's still no hotshoe or viewfinder - something we doubt will ever make it to the GF-series - it's otherwise just about the most feature-packed entry-level compact system camera we've yet seen. There's a new design, 16-megapixel sensor, tilt-angle LCD with touchscreen and built-in Wi-Fi which each add to the series' already established strengths of super-fast autofocus and stacks of Micro Four Thirds lenses to choose from. If you're after a small-sized, compact-like snapper with the ability to swap lenses and capture quality images then the GF6 sure does have plenty of boxes ticked. But are all these new features truly for the better or does the new design, battery-drawing Wi-Fi and the sensor's resolution hike each introduce their own issues compared to the GF5? From the off the GF6 looks a little larger than the GF5. In part that's because it is, but not as much as it may seem to the eye: the body is a mere couple of millimetres larger. It's the GF6's inclusion of the latest 14-42mm kit lens in the box which adds the most physical size compared to the pricier power-zoom version that came with the GF5. We don't mind - in fact we're pleased - as we find the traditional twist-zoom easier to use and it cuts off around £100 from the price which keeps the GF6 kit to a very sensible £499. The body's extra size comes from one important new component: the inclusion of a tilt-angle LCD screen. The 1,040k-dot, 3-inch screen is mounted on a bracket which means it can be pulled away from the body and then angled 45 degrees downwards or a full 180 degrees upwards for a full-on forward-facing position for selfies. Go on, narcissists, that's your cue to get excited - and pretend that you're not. It's very cool. In use we found it easy to manipulate the screen, although with touchscreen controls activated we'd often end up pressing somewhere on the screen and accidentally repositioning the autofocus point. Goes to show just how sensitive this latest touchscreen is - great when it's wanted, a bit annoying when it's not. We also found bright sunlight caused problematic reflections which made assessing exposure a little tricky and, given that there's no viewfinder, there's no way around that. Another big design tweak is the inclusion of a physical mode dial on top of the camera. This isn't completely new to the series as the original GF1 had a similar dial, but each GF camera since had ditched such control in favour of a more streamlined design. Perhaps the GF6 doesn't look as refined, but we think the addition of the mode dial is a positive step that will open the camera up to a broader audience - from point-and-shooters through to those who want easy-to-access manual controls. For our money we'd say that Panasonic's G-series has the fastest autofocus system of any compact system camera brand. There may well be official figures here and there from competitors that would disagree, but as far as across the board performance goes at different focal lengths in various conditions we've got little bad to say about the GF6's speedy performance. The camera itself fires up from off in less than half a second and from there it's possible to nip straight into snapping away. The GF6 is said to have improved autofocus, but it's such a marginal improvement on an already great system that our far slower brains can't really tell the difference. It's one of those blink and you'll miss it things. The main area in which Panasonic is said to have improved is autofocus when snapping subjects in low light. The sensor readout is automatically cut from its full 120 frames per second and slowed down to avoid unwanted focus-hunting when the camera detects dark conditions. In practice the benefit is minimal, at least by terms of comparison to the previous generation model. What we do get is autofocus that will either focus or won't - the given focus point will either say "yes please" or "no thanks" and, in general, we've found it to achieve focus in plenty of scenarios, so long as there's some degree of contrast separation. This honest autofocus feedback is great to have, as it's more realistic than the likes of, say, the Sony NEX-5R's generalised approach in low light. The GF6's autofocus is broken down into a variety of options: there's a 23-area auto mode among the face detection, AF tracking, 1-area and pinpoint options. Our weapons of choice were the final two, as with 1-area and pinpoint it’s possible to press anywhere on the screen to acquire a specific focus point. The pinpoint option zooms in to a 100 per cent image-sized view to show where the exact focus has been acquired. Panasonic still seems to be the only company offering such a precision system. It's great for tasks such as shooting through mesh fences or where prominent contrast areas get in the way of the subject you want to pick out from its busy surroundings and shoot. Single autofocus (AFS) - where the focus depth is confirmed and fixed by a half depression of the shutter - was our preferable focus type, but the GF6 also includes continuous autofocus (AFC) and flexible autofocus (AFF) where the camera will continue to focus at all times, while the latter option acts like AFS but refocuses only if it detects movement within the frame. The results from these are a little mixed, as in low light it's tricky to follow and successfully shoot a moving subject, while close-up focus tends to "pulse" in and out of focus. If you don't know what you want to use and simply want the camera to take over then a single press of the iA - which stands for "intelligent auto" - button on top of the camera will let the GF6 take over, whichever mode happens to be selected on the mode dial. The iA button lights up a fetching blue too, so you'll know it's activated - although in bright sunlight this can be a little trickier to spot. As tech lovers, the concept of the connected camera always excites us. Until, that is, we try out the various methods of delivery that we've seen thus far. Just like the Lumix TZ40 compact camera, the GF6's Wi-Fi and NFC (near field communication) set-up that can be irksome to use. It's all down to passwords. And needing to enter them again and again depending on where you're trying to share an image quickly becomes long-winded. Although the GF6's approach isn't quite as bad as the likes of Canon's Wi-Fi set-up, it does fall into similar issues - first of all there's a lot of application downloading to do. Fine for home use where once it's set up it's ready to roll again and again, but part of the appeal of NFC is to share with others, and if pairing's not quick then it might be cause to give up altogether. The list of sharing options does sound attractive - it's possible to control the camera via your smart device, there's a playback on TV option and images can be sent in real time or post-shooting to smartphone, PC, cloud (Lumix Club account only), web service or AV device - but there are a few key things missing. Notice how there's no Facebook, Twitter or the likes of Dropbox? That's a mistake in our view. We don't want to be forced into using Lumix Club to share via social media as a secondary point and we doubt many other users do either. So we like the idea of Wi-Fi and NFC, but it's not thrilled us in practice. It will have occasional use and is a nice to have but not an essential feature, at least not in this current state. When things simplify - take the Olympus Pen E-P5's use of QR codes to connect to devices - it will open up a wider world. It's also worth pointing out the impact on battery life. We had already found the GF6 doesn't last out all too long in use and using the connected options really doesn't help. In fact this is the biggest single moan we have with this camera - the battery life just isn't good enough. The 16-megapixel Live MOS sensor at the heart of the GF6 may not be as large as many of its competitors - it's 50 per cent smaller than the APS-C sensors found in Sony and Samsung compact system cameras - but Panasonic, and the Micro Four Thirds camp as a whole, is doing a fine job of closing the gap. Even though there's a considerable resolution hike from 12.1-megapixels to 16.1-megapixels, any concern that all these extra pixels would work to the detriment of quality are unfounded. In fact we're very pleased with the quality that the GF6 can produce. Panasonic hasn't confirmed whether the sensor is the same as that found in the G5, but signs would suggest that it is. And that makes for decent quality throughout a large portion of its ISO 160-12,800 range. It's a shame there's no base ISO 50 or 100 setting, but it's tricky to implement such a readout in most modern sensors. Olympus has seen fit to offer an expanded ISO 100 in the latest E-P5 model, but this comes with limitations to dynamic range. No such setting for the GF6. Although the GF6 won't outperform most APS-C sized sensors at the higher ISO settings, the gap isn't as huge as you might think. While we did see a shift in colour in some ISO 3200 shots and detail isn't as abundant as the richer lower ISO shots, the results are still very pleasing. Up to and including this sensitivity we'd say shots are more than passable - they're of good quality, save for some blown highlights here and there. But it’s the lower ISO settings - the ones that will be of most use most of the time - that really impressed us. The ISO 160 setting revealed some super sharp frames and when paired up with the 12-35mm f/2.8 lens we were getting some great soft background effects too. Even right into the mid ISO settings, such as this sunglasses shot, quality remains high with little impact on overall detail. As we say, exposure does seem to side with pulling detail out of the shadows and this can mean that highlights blow out fairly easily. Keep an eye on the exposure compensation dial to ensure shots are as you want them, but make sure you exit the exposure compensation option afterwards, as it otherwise takes control of the rear rotational d-pad and makes it all too easy to shoot with a +/-EV by accident. It can be hard to judge this because of reflections on the rear LCD screen so, as a back-up, we'd advise shooting raw where it's possible to rescue those all important frames should they go a little over. Overall it's happy days in the image quality department. Despite some minor moans we're confident that the GF6 delivers the best GF-series image quality yet and at a higher resolution. It's even worth upgrading for and not just one for first time buyers. But it's not all about stills. The GF6 can shoot 1080p movie clips at up to 60 frames per second using AVCHD capture, or 30 frames per second max via MP4. Although the quality may technically be less in the latter option, it's available for use straight from camera without conversion so we'd recommend it as the option to choose for casual shooters. But it's not just the quality which sells the movie mode, its the way it operates so seamlessly via the touchscreen. A press on the screen will shift the focus point, which then slowly glides into focus with no unwanted over or underfocusing. Although it's not super fast it suits the format, and is particularly effective for smooth transitions between one subject and another. Autofocus can be switched off and there's full access to the AFS, AFF, AFC and manual focus options as in stills shooting. In addition to live exposure compensation, there's also full manual controls which can be adjusted in real time during recording. The only fancy thing that's missing is a microphone input either, otherwise this is top-notch stuff from an apparently entry level camera. What the GF6 gets right, it gets so brilliantly right that it makes us very happy indeed. The 16-megapixel sensor produces image quality that's closing the gap between Micro Four Thirds and the larger-sensor competition, while the super-fast autofocus, tilt-angle LCD screen and new mode-dial-featured design certainly have their individual perks. It's a nod to the original GF1, but brought bang up to date. Movie mode is great too. We do have our moans though: battery life still isn't good enough and Wi-Fi further impacts how long the GF6 will last out. If, that is, you ever happen to use the Wi-Fi options as we found them to be long-winded to set up and too locked down to specific services to be of full use. And there's still no provision to add a viewfinder, but that's the GF-series legacy so we doubt such a feature will ever be included. It's all about context in the end though. For under £500 there are few entry level compact system cameras as fully featured for the cash, even if the Lumix G5 - complete with built-in viewfinder and the same 14-42mm lens - is the very same price. And let's not forget the more stripped-back feature set of the Sony NEX-3N with 16-50mm power-zoon lens comes in at £360 at the time of writing. As the GF-series grows so does it continue to strengthen and while the GF6 is the best model yet we'd still like to see a push in core areas such as battery life. The GF6 has got both still image quality and movie mode wrapped up nicely and there are features aplenty - the GF6 will make good sense for those new to photography, as well as others stepping up to the next level or just those wanting something smaller to use.